The Jacksonville Jaguars will battle the Pittsburgh Steelers in the Divisional round of the postseason. PFF previews the top player matchups of this win-or-go-home game. QB Blake Bortles vs. CB William Gay – While QB Blake Bortles and the Jaguars’ passing attack didn’t do anything to convince skeptics last Sunday, his running ability now gives the Steelers an extra dimension to worry about. Bortles’ run grade of 83.8 ranks 12th among eligible quarterbacks and of his ten rushing attempts last week, six were cases of him scrambling. Those six attempts accounted for 71 of Bortles’ 88 rushing yards this past Sunday. With those numbers, it wouldn’t be surprising if the Steelers had a player ‘spy’ in an attempt to contain Bortles. That player figures to be William Gay, who played just 264 snaps in the regular season. While he didn’t play enough run snaps to qualify, Gay’s run-stop percentage of 14.3 would be the highest mark among all corners this season. How Gay fairs against Bortles’ running could be a major factor in this game. 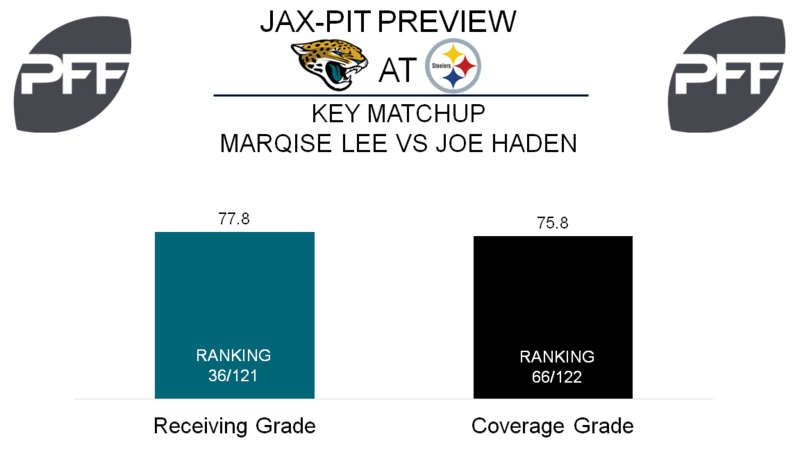 WR Marqise Lee vs. CB Joe Haden – After a two week absence, Lee returned on Sunday and played 35 offensive snaps. With an overall grade of 77.0, Lee turned in his second straight productive season and emerged as Bortles’ favorite target. For the regular season, Lee’s 1.67 yards per route run was a career best but he was not targeted last week. Having lined up primarily on the right side, Lee figures to be matched up against Haden. With an overall grade of 75.5, Haden had a mini-resurgence in Pittsburgh coming off two years where he struggled. Teams were reluctant to test Haden, as his 8.2 coverage snaps per target average was the 14th-highest mark among all corners. If Bortles is going to establish the pass, he’ll need to connect with Lee, so it wouldn’t be surprising if Haden’s targeted at a higher rate than usual. C Brandon Linder vs. DI Javon Hargrave – The Jaguars desire to build a physical ground game centered around Leonard Fournette is hardly a secret. In order for that to work this week, the Jaguars will need a strong performance from Linder, whose run-blocking grade of 76.2 ranked seventh among centers this season. Also strong in pass protection, Linder’s matchup against Hargrave will be fun to watch. When playing the run, Hargrave’s run-stop percentage of 7.0 put him in the middle of the pack among interior defenders. He fared better when rushing the passer, as his pass-rush productivity of 7.3 was 23rd among interior defenders. Linder has been the Jaguars’ most consistent offensive lineman all year, and his success would go a long way towards helping the Jaguars continue their playoff march. 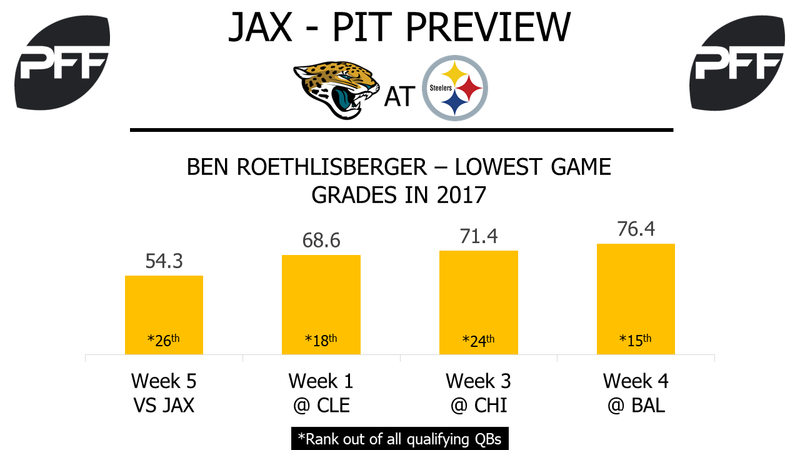 QB Ben Roethlisberger vs. Jaguars defensive line – Roethlisberger gets his wish of facing the Jacksonville defense that intercepted him five times in Week 5. When under pressure, the Steelers’ quarterback threw three interceptions and compiled an 8.9 passer rating under pressure in the previous matchup. He had a 74.7 passer rating under pressure against everyone else this season. The Jaguars defensive line was responsible for 21 of the team’s 22 total pressures in Week 5, including nine pressures from Calais Campbell alone. When Roethlisberger was pressured in that game, nine of his 12 on-target attempts were between the numbers, but four of his interceptions also came on passes between the numbers. With the Jaguars’ dangerous cornerbacks, he’ll need to be sharper over the middle in this one if the Steelers are to continue their playoff journey. WR Antonio Brown vs. CB Jalen Ramsey – Even after missing the final two games of the season, Brown earned the highest grade for a wide receiver (93.7 overall) and first team PFF All-Pro honors. His 19 targets in the Week 5 matchup were the most he saw since Week 9 of 2015, but those targets did lead to a career-high three interceptions thrown when he was the targeted receiver. Jalen Ramsey got one of those interceptions on a contested target. During the regular season, Brown had a passer rating of 119.3 when targeted on his 41 contested targets against any defender other than Ramsey. Ramsey has only allowed a passer rating of 14.2 when contesting passes the entire regular season. At 94.0 overall, Ramsey was and is the highest-graded cornerback that Brown has faced this season. RB Le’Veon Bell vs. LB Telvin Smith – Bell was certainly given many opportunities in Week 5, as his 54 snaps in route was the highest total by a running back in any game this season. He got 25 touches overall, but he wasn’t efficient with his workload. He had his second-lowest yards per rush and third-lowest yards per catch totals of the season against the Jaguars. Smith is the league leader in run-defense grade among linebackers (94.0), but he struggled in coverage, as he missed a league-leading 12 tackles in the passing game, and he allowed 392 yards after the catch, the fourth-most at the position. This could be an area Bell could have the advantage in, as he had 17 missed tackles forced after the catch, eighth-most in the league by a running back.